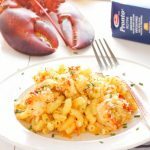 Fresh lobster and tender pasta, nestled in a rich and creamy 3-cheese sauce with a crispy breaded topping browned to perfection. 400 g Barilla Pronto Cut Macaroni feel free to use Barilla Pronto Penne, Rotini, or Half-Cut Spaghetti for this dish too! Place a large, oven-safe skillet over medium high heat and add the Barilla Pronto cut macaroni and the water. Stir until all the pasta is submerged and let the mixture come to a simmer. Simmer the pasta until almost all the water is absorbed, but the pasta is still moist (this should take less than 10 minutes). Turn the heat to medium low and add the Dijon mustard and heavy cream and stir well. Stir in the parsley, the nutmeg, the paprika and the sea salt and pepper. Add the shredded cheeses one at a time starting with the cheddar and ending with the Parmesan, stirring carefully as you add them to make sure the cheese melts into the warm cream sauce that's forming. You'll notice the cream sauce thicken at this point, so add the whole milk a little bit at a time to keep the mixture from becoming too dry. You may not need to add the whole amount, depending on the specific kind of cheeses you use, so watch the mixture carefully to be sure the sauce is thick and creamy and not dry or soupy. Once the sauce has reached your desired texture, add the chunks of lobster and stir them in until they're distributed throughout. In a small bowl, stir together the coarse breadcrumbs, garlic powder and parsley flakes. Sprinkle this breadcrumb mixture over the pasta mixture in the skillet and drizzle the melted butter over the top. Bake at 400 degrees Fahrenheit for about 10-15 minutes until the breaded topping is crispy and light brown. Garnish with some fresh chives, if desired, and serve!